Here is our amazing Chiles en nogada Recipe served to you by Maritza from Mexico. With this dish you will have a nice feeling afterwards. Chiles en nogada is a dish, traditionally served at room temperature with cold cream sauce, from Mexican cuisine. The name comes from the Spanish word for the walnut tree, nogal. 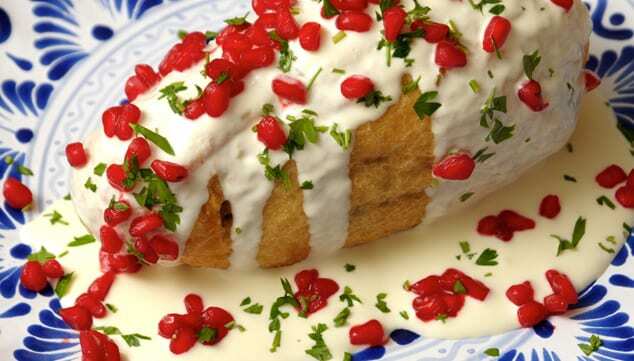 It consists of poblano chilis filled with picadillo (a mixture usually containing shredded meat, aromatics, fruits and spices) topped with a walnut-based cream sauce, called nogada, and pomegranate seeds, giving it the three colors of the Mexican flag: green for the chili, white for the nut sauce and red for the pomegranate. The walnut used to prepare nogada is a cultivar called Nogal de Castilla or Castillan Walnut. The traditional chile en nogada is from Puebla; it is tied to the independence of this country since it is said they were prepared for the first time to entertain the emperor Agustín de Iturbide when he came to the city after his naming as Agustín I. This dish is a source of pride for the inhabitants of the state of Puebla. Some Mexican historians believe the inventors of this dish were the Monjas Clarisas, although others think they were the Madres Contemplativas Agustinas of the convent of Santa Mónica, Puebla. The picadillo usually contains panochera apple (manzana panochera), sweet-milk pear (pera de leche) and criollo peach (durazno criollo). The cream usually has milk, double cream, fresh cheese and washed nuts. The traditional season for making and eating this dish is August and first half of September, when pomegranates appear in the markets of Central Mexico and the national independence festivities begin. In some areas, the dish is created depending on when the pomegranates are ripe – usually between early October and January. Heat oil in a frying pan, fry garlic, onion with cloves and cinnamon to release their aroma. Add the meat, mix a few times and enhances flavor with oregano. Cook until the meat is well cooked and has changed color. Add vegetables, fruits and seeds in order of appearance, allowing time between each to allow enough cook, stir well. Fill the peppers with the mixture and close them well using chopsticks. Save the Granada and parsley; espolvoréales salt, pepper and thyme. Reserve. Your blender incorporates all nogada ingredients until a homogeneous mixture consistency. Serve hot or cold with walnut sauce and garnish with parsley leaves Granada and chiles.